Since cooking is such an important part of a healthy lifestyle, I wanted to share something I did to Tuesday/today since I know sometimes it's hard to come up with ideas for easy meals you can make in bulk. Part of my meal plan this week was to utilize one of the whole chickens I had out in the freezer and use it to make chicken salad for lunches and a pan of chicken enchiladas for dinners. 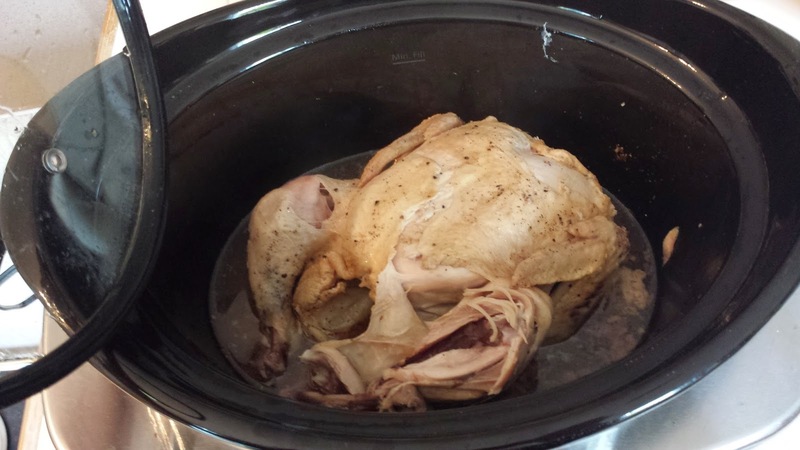 I love oven roasted chicken but for the purposes of the things I was making, I decided to do it the lazy easy way and just "bake" the chicken in the crockpot. You just set the bird in there, salt and pepper her and let the magic of the crockpot take over. (For inquiring minds, the magic was 7 hours on low). The chicken cooks in its own fat/juices so it doesn't dry out, and falls off the bone for easily shredded chicken that you can use in soup, chicken and dumplings, tamales, enchiladas...you name it. I think theoretically you can freeze the meat, but I feel like that would dry it out pretty quickly. It's kind of a two day deal, one day to cook/shred the chicken, another day to use it to make whatever you're making. Well unless you are ambitious and do it all in one day. Since I did this on a weekday, I was not ambitious. Here lies Henny Penny. She was a good bird. From that one chicken I got 6 servings of cherry chicken salad (2 cups chicken breast, 1/3 cup dried cherries, 8 TB mayo and lemon juice/garlic powder/pepper to taste) for sandwiches, and I'll get about 6 servings for the pan of enchiladas I'm making. No special recipe for the enchiladas, just a big can of green enchilada sauce, 1-2 cups of shredded cheese, green onions, shredded chicken and corn tortillas. I just layer my ingredients lasagna style, because I just CAN'T with rolling up the tortillas. No seriously, I can't, the tortillas break every time! 12 meals from one chicken? Not bad my friends! Take the class! I am so uncoordinated, but I took a dance class my senior year of college and it was the best decision ever. I really want to take another this summer. And I need to make that chicken salad recipe! It was really good! I was worried it wasn't enough mayo, but it was just right. The dried cherries are a nice touch to it! Hello there from another Oregonian! Dancing is great fun and wonderful exercise. I love it more than any other form of exercise I do. Misty Copeland is gorgeous. However, I think it's somewhat crazy and completely irresponsible to dance if you have 6 stress fractures in one leg. I think some self-care and recovery time would be in order. Well according to the interview she didn't know she had the fractures, her leg was hurting her but the curtain was about to go up so she had to go out and perform. I think it just about ended her career, so thank goodness she was able to dance again! "I tend to walk diagonal, trip over my own feet and run into door frames type klutzy." You just described me......I like to think the door frames jump in front of me though. I'm going to get a chicken tomorrow and roast that bird in the crockpot. Never even thought of doing that. Thanks for the inspiration! Whole chickens are so economical! That one chicken yielded about 6 cups of shredded meat. If you were planning out freezer meals, you could divide that up for soups, casseroles, whatever! Doing it in the crockpot is so easy, then you don't have to fuss with it at all! You should totally take the class! And I can't walk a straight line stone cold sober so I feel ya on the whole balance issues thing! Thats awesome that you got so many meals off that one chicken!